When pinterest was invented, I pinned these muffins and then never made them or looked at pinterest ever again. But I did eventually make them 3 years later and they are delicious! The recipe says it makes 12, but for me it made 15. I was in sort of a rush and I didnt want them to cook too long. Did you read about all those people who did the apple update on their phone during the night and it turned off their alarms and they were all late for work or missed class? Well that didn’t happen to me because I never update my phone, but coincidentally, my alarm didn’t go off. So after all my blustering about only spending an hour on Fancy Breakfast Friday, I only ended up with half an hour the next week. I made an egg for Luke and muesli for Jack to eat while they waited for their muffins. Jack said it was the best Fancy Breakfast Friday ever, for the third week in a row. 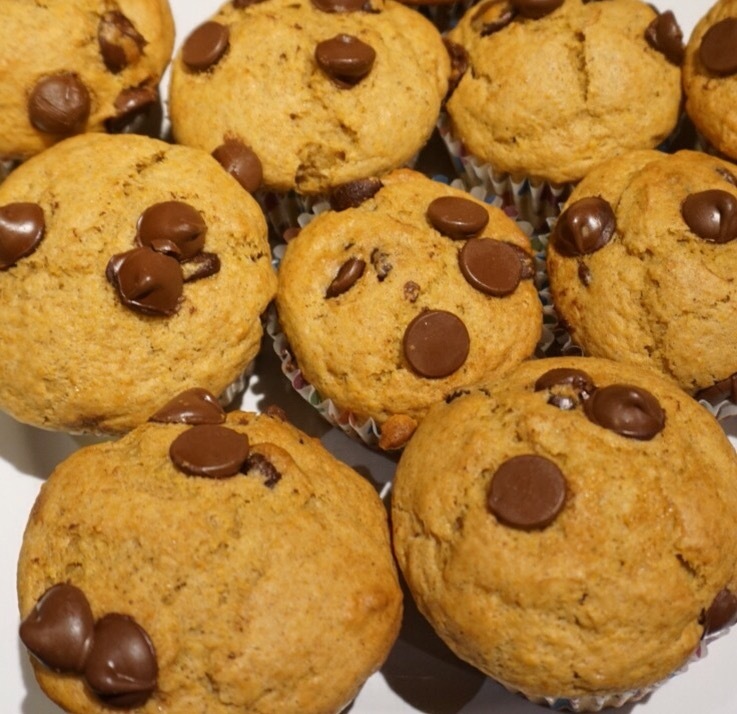 The rest of the muffins were eaten during our hundred activites over the weekend. They even got left in the car over night in a tupperware and were still delcious and moist on Sunday. I feel the need to step up my game for next week because I am not sure these are really “fancy” so we’ll see what I come up with next. This entry was posted in food, Uncategorized and tagged breakfast, chocolate, muffin, pumpkin on November 6, 2015 by metamegan. you can make them less fancy. My mom always made them and called them Pumpkin Eater cupcakes. Start with a spice cake mix and add 1 cup pumpkin and chocolate chips. Or my sisters prefer to start with a yellow cake mix and add 1 cup pumpkin, and a little pumpkin pie spice and chocolate chips. I KEEP WAITING for F.B.F. to be Sur La Table Croissants! Let’s take another class. Please?